Thank you for reading this and doing further research about Invisible Children and Kony 2012. In response to this explosion of interest about the Kony 2012 film, there have been hundreds of thousands of comments in support of the arrest of Joseph Kony and the work of Invisible Children. However, there have also been a few pieces written that are putting out false or mis-leading information about these efforts. This statement is our official response to some of these articles and is a source for accurate information about Invisible Children’s mission, financials and approach to stopping LRA violence. Invisible Children’s mission is to stop LRA violence and support the war affected communities in Central Africa. These are the three ways we achieve that mission. Each is essential: 1) Document and make the world aware of the LRA. This includes making documentary films and touring these films around the world so that they are seen for free by millions of people. 2) Channeling the energy and awareness from informed viewers of IC films into large scale advocacy campaigns that have mobilized the international community to stop the LRA and protect civilians. 3) Operate programs on the ground in the LRA-affected areas to provide protection, rehabilitation and development assistance. As you will see, we spend roughly one third of our money on each of these three goals. This three-prong approach is what makes invisible children unique. Some organizations focus exclusively on documenting human rights abuses, some focus exclusively on international advocacy or awareness, and some focus exclusively on, on-the-ground development. We do all three. At the same time. This comprehensive model is intentional and has shown to be very effective. 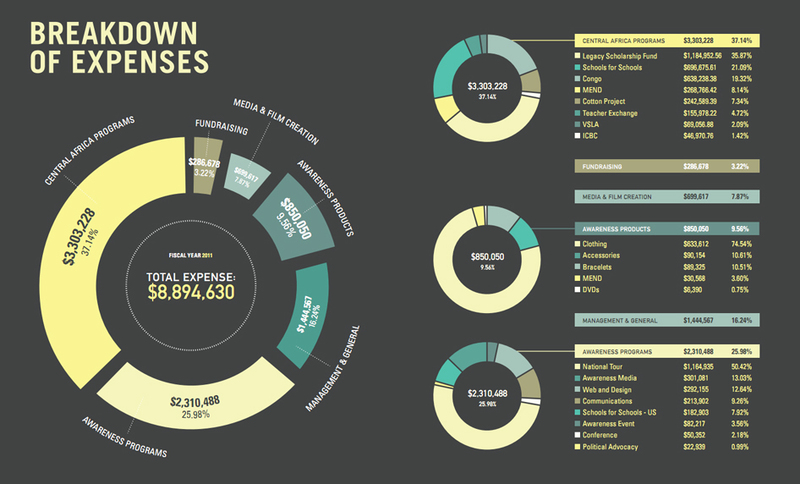 Invisible Children’s financial statements are online for everyone to see. Financial statements from the last 5 years, including our 990, are available at www.invisiblechildren.com/financials. The organization spent 80.46% on our programs that further our three fold mission, 16.24% on administration and management costs and 3.22% on direct fundraising in FY2011. Invisible Children is independently audited every year and in full compliance with our 501 c 3 status. Below is a screen-shot from pages 35 and 36 of the 2011 Invisible Children annual report that detail our total expenses for Fiscal Year 2011. An expense statement by class is the way nonprofits present their expenses to the public because it’s the clearest way to show the purpose of different organizational expenses vs. a line item expense statement such as the one on Page 6 of our Audited Financial Report. Charity Navigator gives our Programs its highest rating of 4 stars. Our Accountability and Transparency score is currently at 2 stars due primarily to the single fact that Invisible Children does not have 5 independent voting members on our board of directors–we currently have 4. We are in the process of interviewing potential board members, and we will add an additional independent member this year in order to regain our 4-star rating by 2013. We have been independently audited by Considine and Considine, since the fiscal year end of June 30, 2006 and all of our audits have resulted in unqualified opinions on the audit reports. A story told by Jason Russell: The photo of Bobby, Laren and I with the guns was taken in an LRA camp in DRC during the 2008 Juba Peace Talks. We were there to see Joseph Kony come to the table to sign the Final Peace Agreement. The Sudan People’s Liberation Army (SPLA) was surrounding our camp for protection since Sudan was mediating the peace talks. We wanted to talk to them and film them and get their perspective. And because Bobby, Laren and I are friends and had been doing this for 5 years, we thought it would be funny to bring back to our friends and family a joke photo. You know, “Haha – they have bazookas in their hands but they’re actually fighting for peace.” The ironic thing about this photo is that I HATE guns. I always have. Back in 2008 I wanted this war to end, like we all did, peacefully, through peace talks. But Kony was not interested in that; he kept killing. And we still don’t want war. We don’t want him killed and we don’t want bombs dropped. We want him alive and captured and brought to justice. IC's ENTIRE STATEMENT CAN BE READ HERE.